Ned Newley doesn’t even want to be Governor. He’s terrified of public speaking; his poll numbers are impressively bad. To his ever-supportive Chief of Staff, Ned seems destined to fail. ​But political consultant Arthur Vance sees things differently: Ned might be the worst candidate to ever run for office. Unless the public is looking for… the worst candidate to ever run for office. "There is no doubt about it. The Outsider is one of the funniest shows you will see this year." Paul Slade Smith is a writer and actor based in Brooklyn, New York. 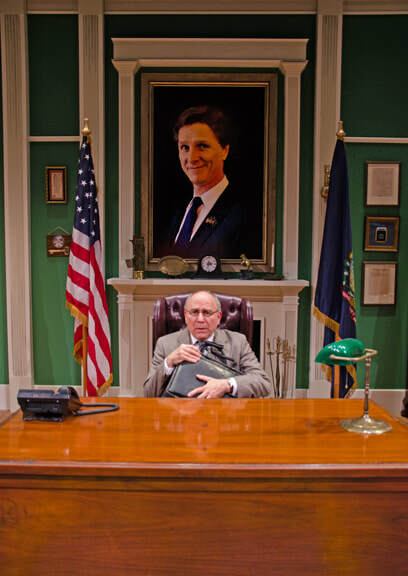 His play, Unnecessary Farce, winner of nine regional theatre awards, has had over 250 productions throughout the United States and in Canada, Great Britain, Switzerland, Iceland and Singapore. As an actor, Paul is currently appearing in the Australian premiere of Charlie and the Chocolate Factory. His past credits include the original Broadway casts of Charlie and the Chocolate Factory, Finding Neverland and the 2018 revival of My Fair Lady at Lincoln Center​, national tours of Wicked and The Phantom of the Opera, and productions at American Repertory Theatre, Chicago Shakespeare Theater, The Goodman and Steppenwolf. The Outsider was originally produced at Peninsula Players Theatre in Wisconsin, where it was honored with seven Milwaukee Awards nominations -winning three awards, including Best Play of 2015. The play received its second production at Paper Mill Playhouse at the beginning of 2018.